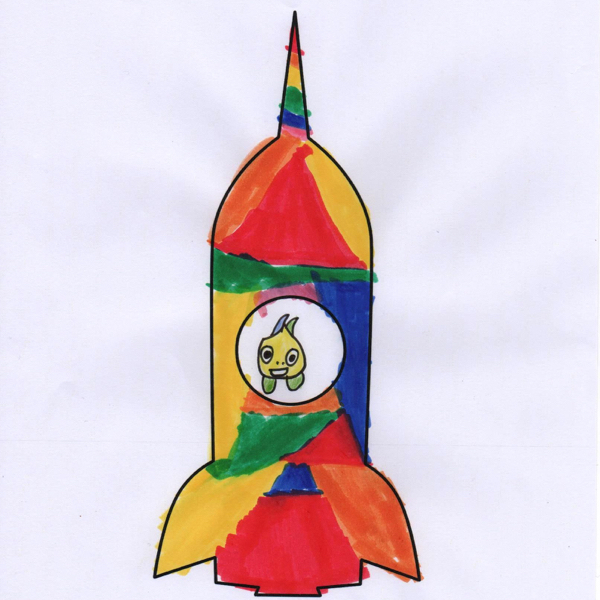 Here is just a handful of the amazing entries we recieved in our Design-a-Rocket competition - we were bowled over by the creativity and beautiful artwork! 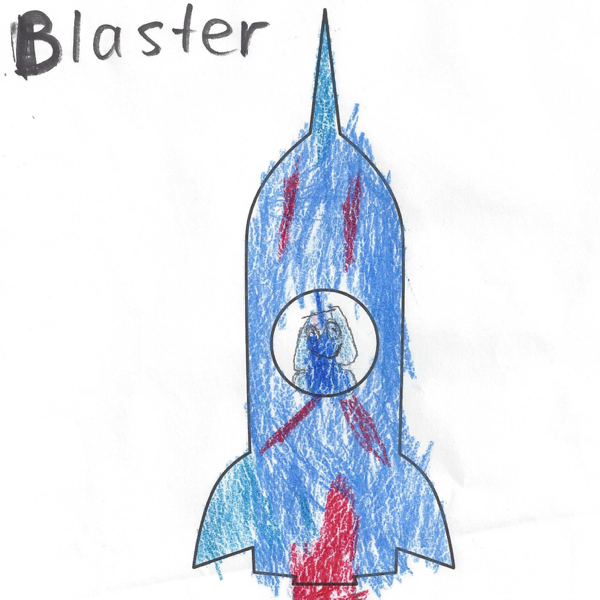 The winner and two runners up will each recieve an Amazon voucher and the graphics we've created based on their rockets will appear in our next app! Oh, how we love this rocket! 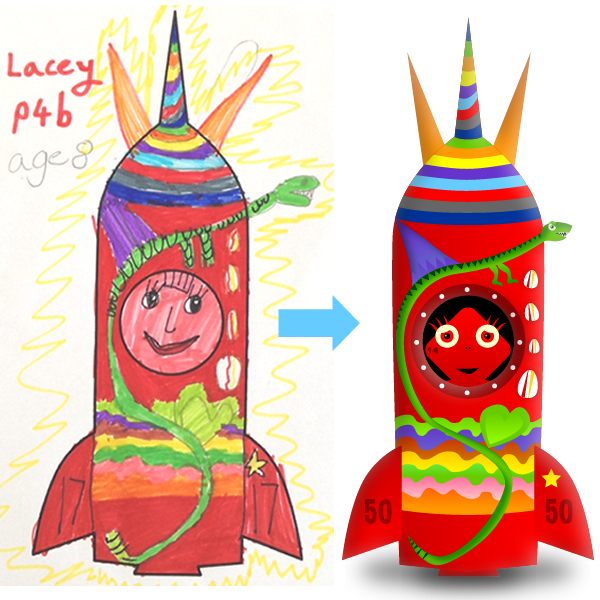 From the magical animal that snakes around the rocket window, to the different areas of colour and detail, we completely fell in love with Lacey's rocket design. 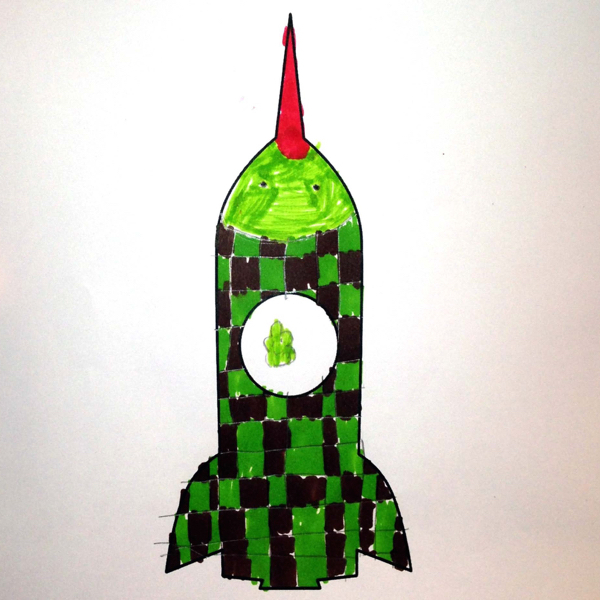 We're so delighted to have this rocket appearing in our next app! We've changed the number Lacey gave it to 50, so that it will be the most valuable rocket it's possible to collect! We all fell in love with Zachary's beautiful dolphin design the moment it arrived in our inbox. 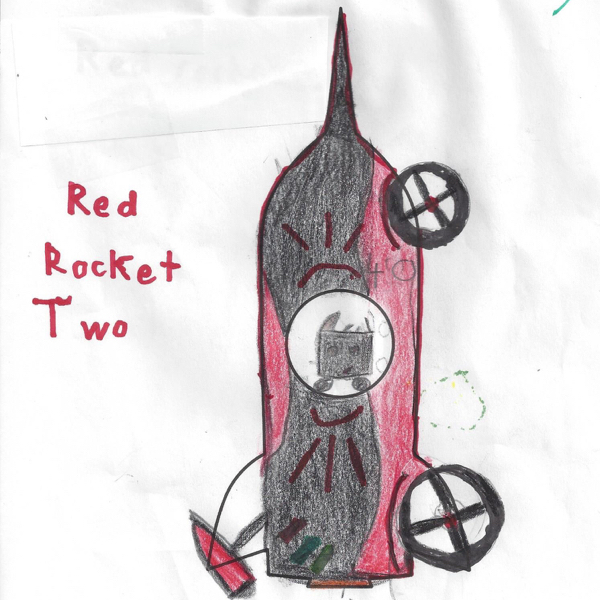 We know from experience that naming rockets can sometimes be as difficult as coming up with the design itself, so Zachary's rocket ticks both boxes here for brilliant artistry and a cracking name! 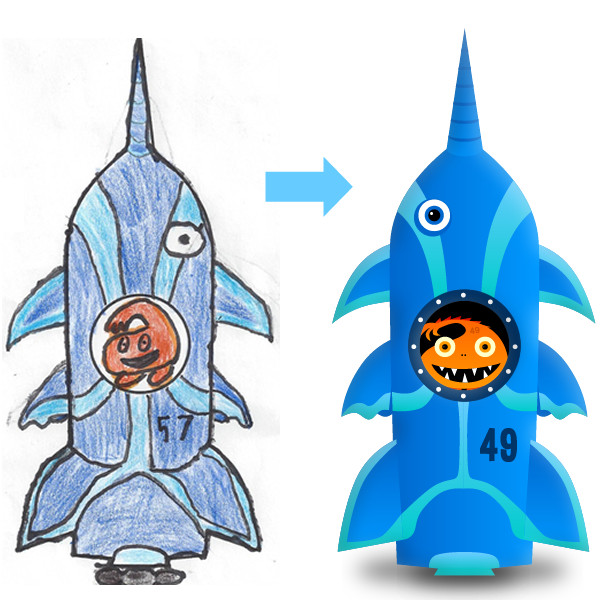 We're so pleased that The Flin Flipper rocket will be appearing in our next app! In fresh, bright colours, Harry's rocket made us feel like we were being whisked back in time to a 1950s cinema. We think Harry's popcorn is the most realistic it's possible to draw with a felt-tip pen, so we're in awe of his artistic abilities. Thank you so much for allowing us to feature your work in our next app, Harry - we loved recreating your design! 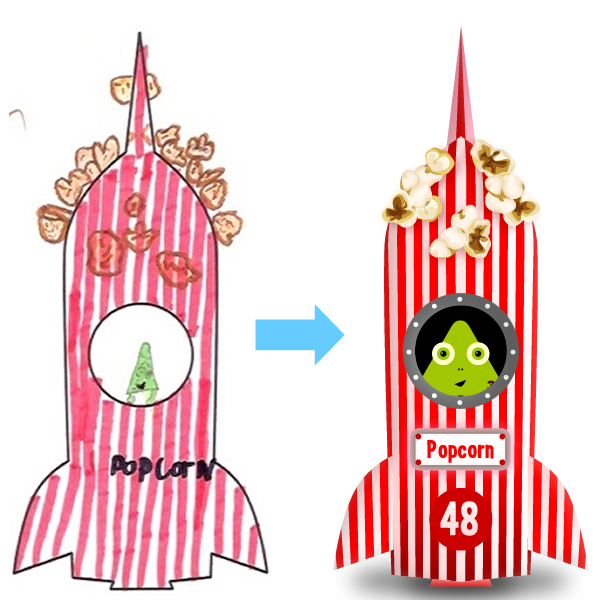 Having spent weeks thinking up rocket designs ourselves, we were delighted when this entry arrived in our inbox! 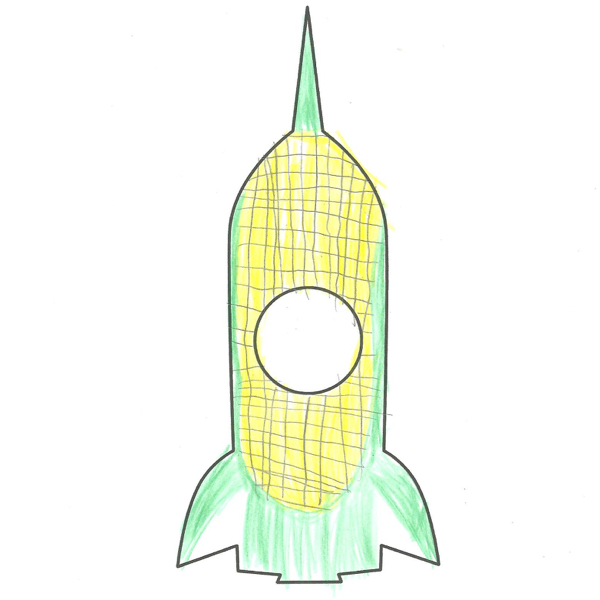 Corn-on-the-Cob lends itself perfectly to the rocket shape, but it hadn't even occurred to us! What a wonderful idea, Lilac! We adore this rocket and it was a close contender for winning! It has everything: skull & crossbones; a beautiful weeping face; pipes; spanners; tubes that shoot out interesting things; and a beady eye that's watching us! Topped off with rainbow nose (we spent a while trying to decide what the technical term for the pointy bit of a rocket is! 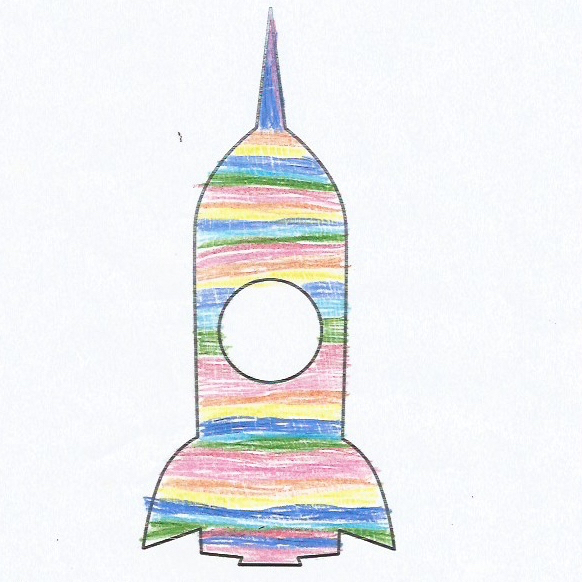 ), Daniel's Rocket is bursting with a jigsaw of coloured shapes. We love it. To us, this looked like studded metalwork on the outside of the rocket - very industrial and very likely to be capable of surviving in space! 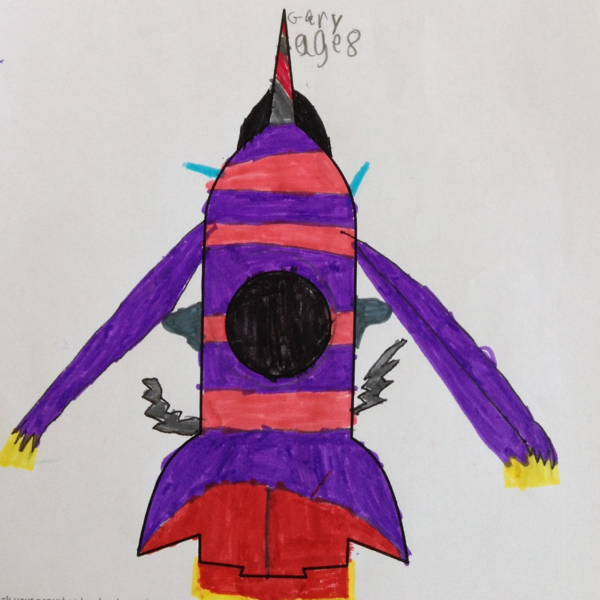 We love the creature inside, who has camouflaged himself to match his rocket. 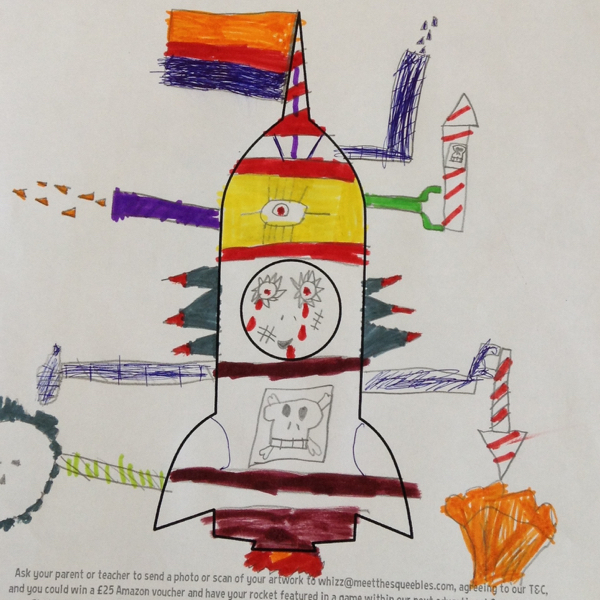 We loved Alexander's car-themed rocket and can imagine it would travel up into the sky at an unprecedented speed! We're interested to know where Red Rocket One is and whether it's missing in action...either way, Red Rocket Two is a wonderful design. We're not exactly sure what species this checkerboarded creature is, but to us it looks very birdlike...possibly an exotic parrot. Thank you so much for sending us your wonderful design, Samuel. 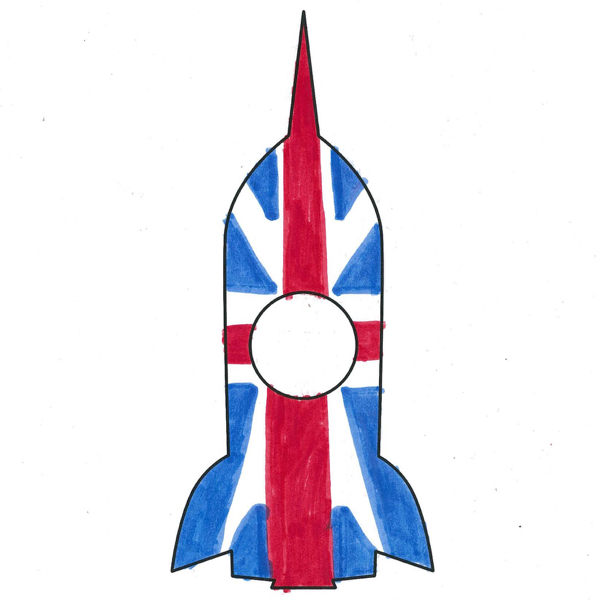 A truly patriotic rocket, we think this may be one to send to the British Space Programme as inspiration for future rocket designs! 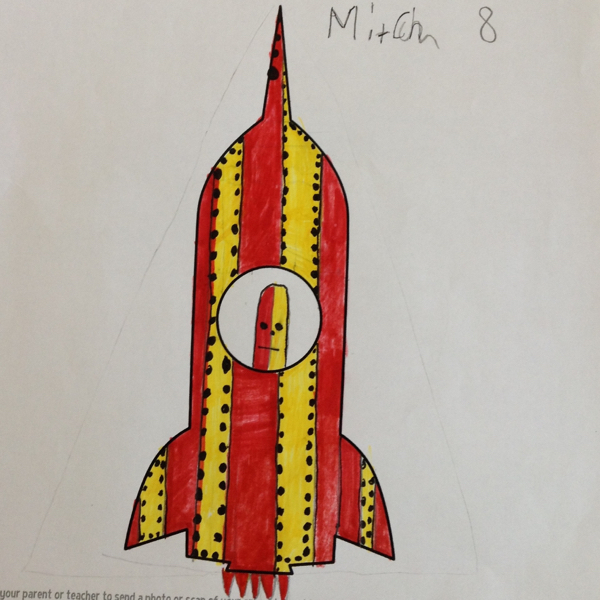 We love how cleverly you've worked the complicated flag design into the rocket template, Bayley - it's perfect! 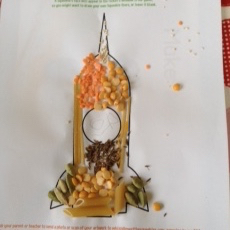 We were so taken with Hannah's rocket - the lower teeth and tongue poking out beneath the window of the space rocket is an inspired idea! 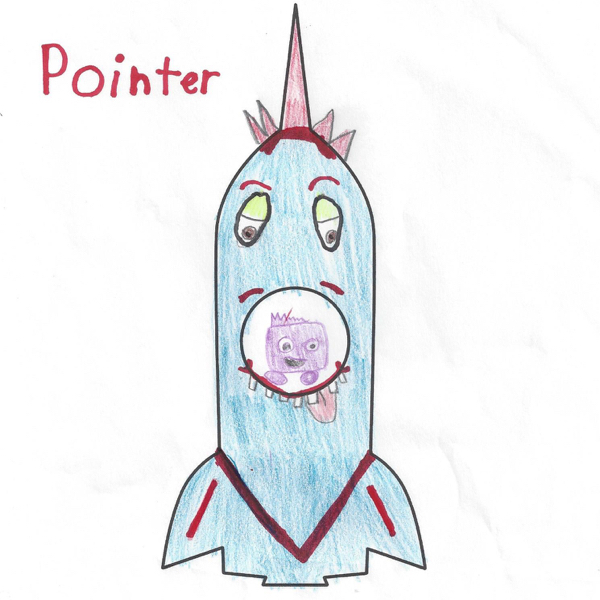 And we love the expression in Pointer's eyes. A masterpiece! Ignatius is just four years old, but already is producing some of the most lovely colouring we've seen! Look at the colouring in the nose of the rocket - it's so precise! We love your design, Ignatius. 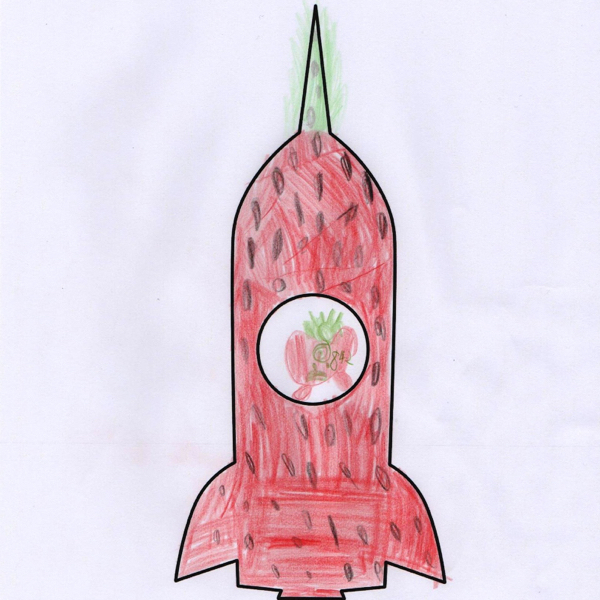 We loved Joshua's strawberry design and this is evidence of great minds thinking alike, because we'd actually already designed a strawberry rocket ourselves. Watch out for your strawberry's twin in the finished game, Joshua! We love how juicy and sweet your rocket looks. 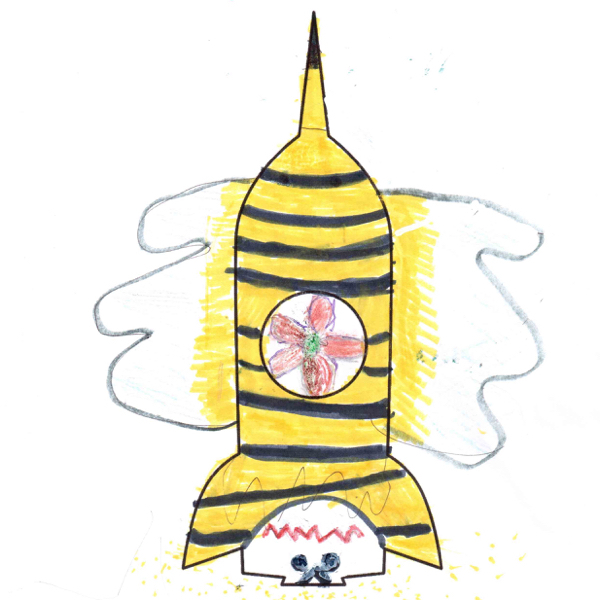 We love Natalya's beautiful bumble bee rocket, with its delicate wings! The stinger is cleverly worked into the launcher area and the bee's source of nectar is at the heart of the rocket, in the window! Such a carefully planned design, Natalya - thank you! We really loved Philip's design - it's the only entry we received that was 3D and broke away from conventional art materials! We're impressed, Philip! We'd be slightly worried that if a hungry Squeeble was sent into space with this one that they may start eating their own rocket! A fire-breathing dragon! It's a beauty and we love the extra jaw Ben has created for him on the nose of the rocket. 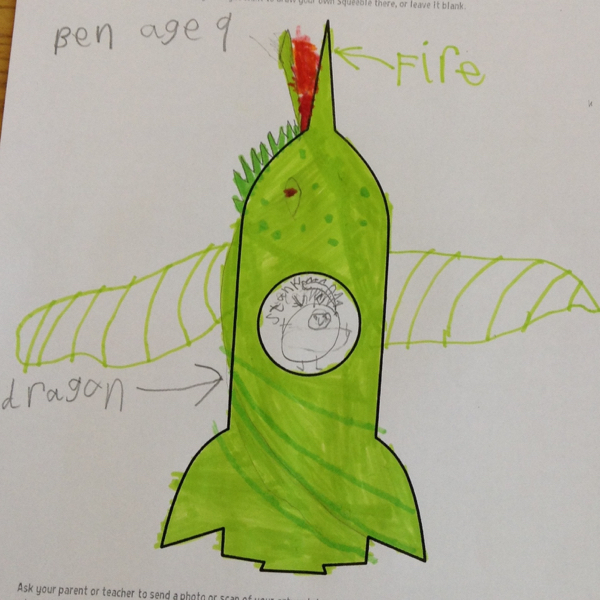 We've designed a few rocket dragons ourselves already, but none quite so lusciously green! We love the subtle markings on his face too - thank you, Ben! Gary has given his rocket extra wing boosters and something that looks like spiky defenders that could offer protection if needed! We love the bright colours - purple and pink are such a good combination. A butterfly! We hadn't thought of this ourselves, but of course the rocket shape lends itself perfectly for having wings attached to either side. We love the butterfly's smiling face and perky antennae. 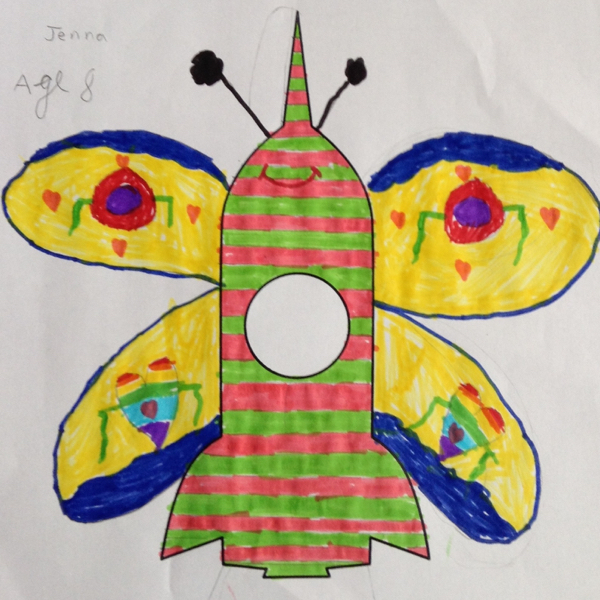 What a beautiful design, Jenna. 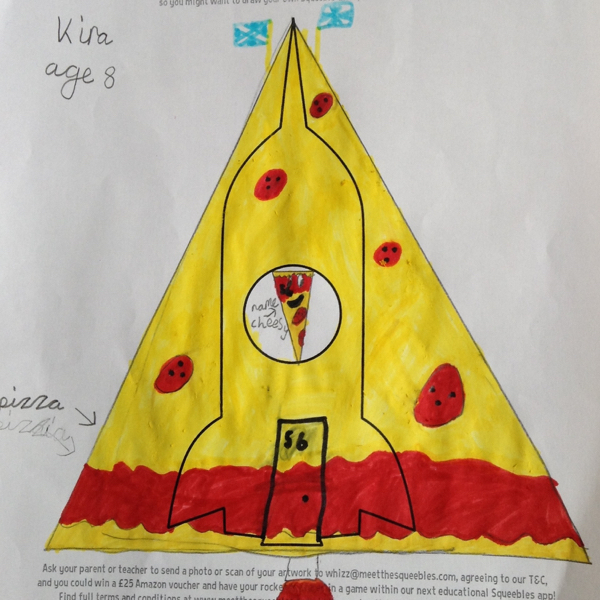 Everyone who works at KeyStageFun is guilty of having a huge fondness for pizza, so we were delighted by Kira's cheese and tomato flavoured rocket! What a brilliant design. Simple but effective, Poppy's rainbow rocket is a great idea, beautifully executed. Thank you so much for taking the time to colour for us, Poppy! Another really colourful design, and with so much detail! 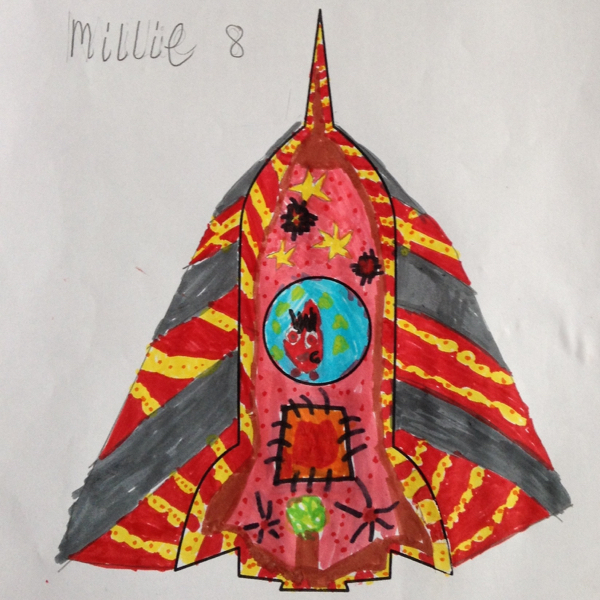 We are big fans of pink and red as a colour combination, so we loved seeing it used to brilliant effect in Millie's rocket. 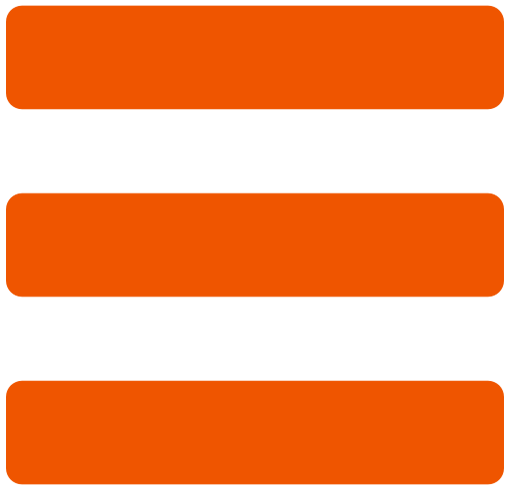 A really thoughtful, cheery design. Thank you, Millie.